I haven’t been posting here very often as my medical and disability issues got kind of intense. I went on short-term disability for a couple of months, and am going to stop working full time for a little while. While I’m leaving my job at Socialtext, I’m going to continue contracting for them on an occasional basis. Working at Socialtext was an intense experience, less like drinking from the firehose and more like being blasted by a giant non stop river of information and communication. It was very interesting “ambient work.” I hung out with my co-workers on many wikis, on chat, irc, over email, and sometimes in person. Tony Bowden, Casey West, and Dan Bricklin worked with me on an open source release of Socialcalc and on planning its possibilities, as well as working on open source licensing and legal issues. I was on call any time for Ingy döt Net to test his wiki hacks and help him debug, and Perl goddess Kirsten Jones was always around to help me with my questions. I got to hang out in Socialtext’s co-working space and have some great conversations with Adina Levin and Pete Kaminski, and especially appreciated Adina’s willingness to listen and to take time to act as a mentor. Chris Dent wrote so much great & thoughtful wiki theory and thoughts on software development; I just wish I had gotten to pair with him on a project, but maybe sometime in the future. It was great working with Jon Prettyman, Chris McMahon, Shawn Scantland, and Ken Pier on new releases, and any time I got to work with or hang out with Lyssa Kaehler, Zac Bir, Melissa Ness, or Brandon Noard it was a pleasure. Probably the nicest part of working at Socialtext, I mean besides the decadent hot tub parties, was getting to team up with Luke Closs, whose super clear explanations and agile coaching totally rocked my world. Seriously, I can’t say enough good things about the engineering, support, and QA crew at Socialtext. Then, I think of how Socialtext basically paid me to spend time helping with things like BarCampBlock and Wiki Wednesday. The Wiki Wednesdays were especially lovely. It was kind of funny, because all the literary readings I have run in the past turn out the same way; an eclectic crowd of people who don’t know each other and wouldn’t otherwise have met, kicking around ideas in a laid back atmosphere — rather than big events that are lecture-style. I also really like to find interesting people who are not the usual suspects; who are total rock stars but in a small niche that is not visible to people who are rock stars in other niches. Anyway, it was through Wiki Wednesday (and sometimes through random co-working arrangements) that I met fun and inspiring people like Eugene Eric Kim, Jack Herrick, Eszter Hargittai, Bryan Pendleton, Betsy Megas, and Philip Neustrom. Wiki Wednesday is continuing, run once again by Socialtext’s social media visionary Ross Mayfield. I hope that a good crowd of people from different wiki communities, platforms, and companies will flock to the event. Other local wiki events coming up: the Freebase User Group run by Kirrily Robert at Metaweb, which just happened, but another one is coming up in April. And then, a fantastic-sounding wiki event I haven’t been to yet, Recent Changes Camp, which will happen May 9-11 in Palo Alto, and which I hope will be as good as the past ones in Portland and Montreal. I’ve been organizing Wiki Wednesdays for 7 months now! It’s really fun. So you see that this month’s Wiki Wednesday will be especially awesome. We have that team synergy thing going. Or did I scare you? Do show up, tomorrow night, at Socialtext’s co-working office in Palo Alto, 695 High Street, 6:30pm. If you want to give a lightning talk or demo, let me know. Next month, December 5th, our Wiki Wednesday speakers will be Philip Neustrom and Arlen Abraham, WikiSpot and DavisWiki developers. Recent Changes Camp 2008 organizing has not kicked off yet, but I believe it will be in San Francisco or in the Bay Area, March 2008. I am super happy that Wikimedia Foundation is moving to San Francisco. That will really boost our already fantastic wiki community here in the Bay Area. And a final thought about events and gender. In conversation with Sarah Dopp about BlogWorldExpo, I thought over my own track record as an organizer. Out of 11 speakers for Wiki Wednesday, I would like to point out that the gender ratio is nearly even, at 7 men and 5 women. It’s not like that took special effort, honestly. I also consider that I have done a decent job of being even-handed and community-minded, promoting Wiki Ohana across many different wiki companies and communities, inviting speakers and participants from Blue Oxen, WikiHow, Twiki, PBwiki, Confluence, Wiktionary, WikiSpot, and Wikipedia, as well as researchers and academics from Stanford, Northwestern, and Xerox PARC. In fact, this is the first month I have had speakers or even demos from Socialtext. I have to say, I’m happy to work for a company that sponsors me to do this as part of my job, without requiring me to do any sort of special marketing or promotion. I’m hosting Wiki Wednesday tonight in San Francisco at Citizen Space, at 6:30pm. Please come tonight! You can sign up on upcoming, or on the wiki page itself. My friend Craig Rosa will be speaking along with two colleagues from KQED’s Quest science education program, Lauren Sommer and AJ Alfieri-Crispin. The TV show, radio program, and web pages are all tied together; you can go on one of their explorations in the San Francisco Bay Area, and use GPS and Flickr to contribute to the site. I’m very curious to hear how wikis have made their job easier! There will be pizza and beer, and probably a lively discussion after the talk. Our events are often pretty small, around 10-20 people. This one might be bigger. This will be the 6th Wiki Wednesday I’ve run, and I’m really having fun with it! Thanks very much to Betsy Megas, Eugene Eric Kim, Brian Pendleton, Eszter Hargittai, Yoz Grahame, and Rashmi Sinha for coming to give such excellent talks and leading our discussions so far this year. Meanwhile, I’m gearing up for a trip to Beijing, and for the She’s Geeky unconference on Oct. 22-23 in Mountain View at the Computer History Museum. I’ll blog more about both those things later this week! 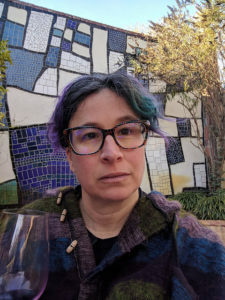 September’s Bay Area Wiki Wednesday featured Betsy Megas, a mechanical engineer and Wiktionary administrator, known in the wikiverse as Dvortygirl. 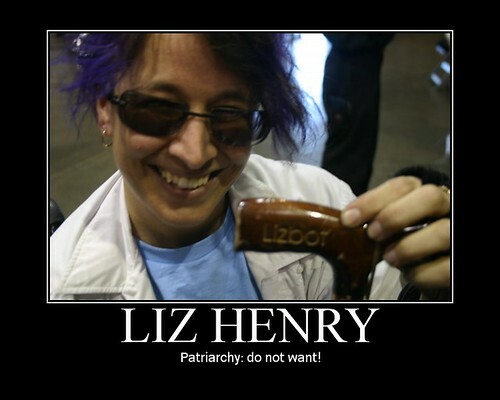 She’s a Wiki Wednesday regular and spoke at Wikimania 2006. In her talk, she gave us a ton of information on the history of Wiktionary, a tour of its interesting features, and thoughts on possible future directions for this worldwide, massively multilingual collaboration. Betsy started by explaining the difference between Wikipedia and Wiktionary. Wikipedia’s goal is to capture all the knowledge in the world. Except for dictionary definitions! Wiktionary’s modest goal is to include all words in all languages. While an encyclopedia article is about a subject, a dictionary definition is about a word. But what is a dictionary? Betsy went to a library to browse dictionary collections. Some dictionaries focus on types of words: cliches, law, saints, nonsexist language. Others center around types of content: rhymes, usage, etymology, visual information. Others are dictionaries of translation. Wiktionary, because it’s not paper, is searchable, unlimited by size; it can evolve; and it has strong ties to people who edit it, and to communities of its editors. Wiktionary content includes audio pronunciations, definitions, etymologies, metadata such as a word’s frequency in English according to all the text on Project Gutenberg; pictures (such as this great photo illustrating the concept of “train wreck“); and videos attached to a word, for example, videos of how to express a word in American Sign Language. It also includes translations. We went off on a few speculations to future directions for Wiktionary, Wikipedia, and perhaps the entire web. What if links knew why they were linked? For example, why is “Lima” linked to “Peru”? Betsy thinks that we are missing out on a lot of metadata that could be quite useful. And for Wiktionary specifically, what if we had categories that were structured around the functionality of a word, for example, its part of speech? Betsy then went on to sketch out basic entry layout – which is different in different languages, but which for English is referred to as WT:ELE. She explains the problem of Wiktionary as “We have structured data, and no structure”. This is a problem and a feature of many wikis! *Add verifiable references here to show where you found the word in use. Other useful tools depend mostly on automated detection of problems, relying on human beings to do the cleanup by hand. For example, Connel MacKenzie wrote a bot to list potentially messed-up second level article headers, but a person checks each link by hand to do the gardening. Structurelessness or being structure-light can be a problem for sensible reuse of Wiktionary content. Other dictionary projects such as Onelook and Ninjawords have used content from Wiktionary, but ran into difficulties with their imports. Is Wiktionary content reusable? Yes, but barely. Somewhere in the mix, we also discussed WT:CFI (Criteria for Inclusion) and WT:RFV (Requests for Verification). But then, the truly fascinating stuff about translation and multilingual collaboration. Words, or definitions, exist in many places. For example, we might have an English word defined in the English Wiktionary and the Spanish Wiccionario, and then a Spanish equivalent of that word also defined in both places. So, a single word (or definition, or lexeme) can potentially exist in a matrix of all the 2000+ languages which currently have Wiktionaries (or the 6000-7000+ known living languages) squared. Fortunately, this template has a lovely Talk page which explains everything. We all sat around marvelling at the extent of language, and the ambition of the multilingual Wiktionary projects. The scope of OmegaWiki was impressive. As Betsy and Ariel demonstrated its editing interface for structured multilingual data, I got a bit scared, though! Maybe a good future step for OmegaWiki contributions could be to build a friendlier editing UI on top of what sounds like a very nice and solid database structure. We also took a brief tour of Wordreference.com and its forums, which Wordreference editors go through to update the content of its translation dictionaries. I surfed during Betsy’s talk that the Spanish Wiktionary has a core of only 15 or so die-hard contributors. So, with only a little bit of sustained effort, one person could make a substantial difference in a particular language. The guy who is scanning the OED and who works for the Internet Archive talked about that as an interesting scanning problem. We told him that Kragen has also worked on a similar project. The IA guy, whose name I didn’t catch, described his goals of comparing his OCR version to the not-copy-protected first CD version of the second edition. Chris Dent brought up some interesting ideas as we closed out the evening. What is a wiki? When we talk about Wikipedia or Wiktionary or most other wiki software implementations, really we’re just talking about “the web”. And what he thinks wiki originally meant and still means is a particular kind of tight close collaboration. As I understand it, he was saying that possibly we overstate wiki-ness as “editability” when really the whole web is “editable”. I thought about this some more. We say we are “editing a page” but really we are creating a copy of the old one, swapping it to the same url, and making our changes. The old page still exists. So for the general web, we can’t click on a page to “edit” it, but we can make our own page and reference back to the “old” page, which is essentially the same thing as what most wiki software does; but at a different pace and with different tools and ease of entry/editing. So his point is that wiki-ness is about evolving collaborative narratives. I’m not really sure where to go with that idea, but it was cool to think about and I was inspired by the idea that the entire web, really, has a big button on it that says “Edit This Page”. As is often the case, we had low attendance, but a great speaker and unusually good group discussion. I’m happy with only 10 people being there, if they’re the right people. And yet I feel that many people are missing out on this great event. Betsy’s going to give me her slides and an audio recording for this month, but next month I will try to get a videocamera and record the entire event. If any actual videobloggers would like to come and do the recording, I’d love it. Also, tune in next week, or September 16, for the San Francisco Wikipedia/Mediawiki meetup!